UNDP-ACIAC provides a platform for multi-stakeholder cooperation against corruption in the Arab region, and in this context, it works to generate a coherent body of specialized knowledge and to transfer key skills to the concerned policymakers and practitioners from governments, civil society and the business community. On this page, you will find resources that are relevant to the work of UNDP-ACIAC. Those resources include publications that have been developed with the support of UNDP-ACIAC as well as by other organizations that operate at the national, regional and international levels. They also include the legal compendium which is a compilation of legal texts, from Arab countries, that are directly relevant to anti-corruption and integrity. This document is an advance copy published for open consultation and peer review. To share your insights and comments (before 31 August 2018), and for information regarding the appropriate use of this document, contact the UNDP Regional Project on Anti-Corruption and Integrity in Arab Countries at aciac@undp.org. The Constitutional Transitions Clinic ‘back office’ has, from 2011 to 2014, prepared a series of thematic, comparative research reports on issues in constitutional design that have arisen in the Middle East and North Africa. The first three of these reports are jointly published by Constitutional Transitions and International IDEA. The second three are jointly published by Constitutional Transitions, International IDEA and the United Nations Development Programme. The reports are intended to be used as an engagement tools in support of constitution building activities in the region. The Head of the Government of Tunisia, Mr. Habib ESSID, presented the achievements of his Government and outlined its future orientations in his speech to the Assembly of the Representatives of the People on 5 June 2015, on the occasion of the first one hundred days after the formation of the Government. In it, he stated that there is no room for normalization or co-existence with corruption or the corrupt in post-revolution Tunisia, underlining his Government’s commitment to move forward in the fight against corruption in all its forms and without any tolerance. He also stated his Government’s key achievements in this regard, which is the series of Bills that were developed in cooperation with all concerned stakeholders. He singled out the support of UNDP in a sign seen by observers as telling of the robust partnership between the two and the added value the UNDP brings to related reform efforts. The Non-Governmental Group of the Arab Anti-Corruption and Integrity Network (ACINET) developed a series of Position Papers on priority themes related to the implementation of the UN Convention against Corruption (UNCAC) in the Arab countries. This paper comes in the framework of the aforementioned series and deals with the theme of ending the culture of impunity. It discusses key related challenges and presents the Group’s position on how to address them in light of international standards and good practices and lessons learned from comparative experiences. The Non-Governmental Group of the Arab Anti-Corruption and Integrity Network (ACINET) developed a series of Position Papers on priority themes related to the implementation of the UN Convention against Corruption (UNCAC) in the Arab countries. This paper comes in the framework of the aforementioned series and deals with the theme of protecting the State's public properties against corruption. It discusses key related challenges and presents the Group’s position on how to address them in light of international standards and good practices and lessons learned from comparative experiences. The Non-Governmental Group of the Arab Anti-Corruption and Integrity Network (ACINET) developed a series of Position Papers on priority themes related to the implementation of the UN Convention against Corruption (UNCAC) in the Arab countries. This paper comes in the framework of the aforementioned series and deals with the theme of realizing the right of access to information. It discusses key related challenges and presents the Group’s position on how to address them in light of international standards and good practices and lessons learned from comparative experiences. The Non-Governmental Group of the Arab Anti-Corruption and Integrity Network (ACINET) developed a series of Position Papers on priority themes related to the implementation of the UN Convention against Corruption (UNCAC) in the Arab countries. This paper comes in the framework of the aforementioned series and deals with the theme of recovering assets derived from corruption. It discusses key related challenges and presents the Group’s position on how to address them in light of international standards and good practices and lessons learned from comparative experiences. 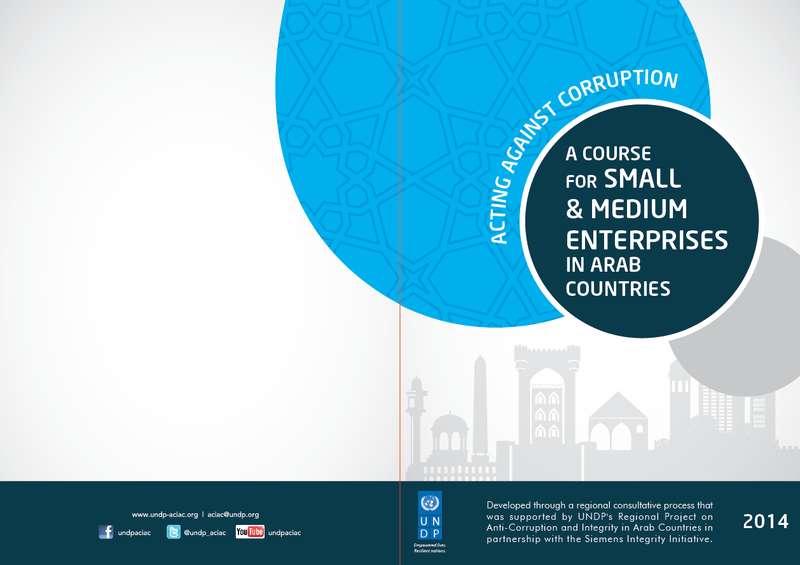 The “Acting Against Corruption: A Course for Small and Medium Enterprises in Arab Countries” includes a Course Book, PowerPoint Presentations and a User Guide for deployment. The Course covers three main sections including (a) an introduction and the business case against corruption with a focus on relevance for SMEs in Egypt, Morocco or Tunisia; (b) a matrix of scenarios of State-to-Business corruption and possible corresponding integrity solutions in the context of the country in question; and (c) the UN’s multi-dimensional approach against corruption, with a focus on the situation in the country in question. The Course was developed through a consultative process that included independent experts and representatives of the business community in the Arab region with the support of UNDP-ACIAC and in partnership with the Siemens Integrity Initiative. The content of the Course is currently made available only to implementing partners which are the Arab Institute of Business Managers in Tunisia, the General Confederation of Enterprises of Morocco, and the Egyptian Junior Business Association. It will be made available to the public at the next ministerial conference of the Arab Anti-Corruption and Integrity Network (ACINET) expected to take place in February 2016. The Course on “Anti-Corruption and Integrity for Law Faculties in Arab Countries” includes a Course Book and a User Guide for deployment. The Course cover four main sections including (a) background on corruption; (b) general approaches against corruption; (b) selected legal tools to prevent and combat corruption; and (d) state of legal tools to prevent and combat in specific countries. It was developed through a consultative process that included independent experts and representatives of the business community in the Arab region with the support of UNDP-ACIAC and in partnership with the Siemens Integrity Initiative. The content of the course is currently made available only to implementing partners which are the Faculty of Juridical, Economic and Social Sciences, at the Mohamed V University in Agdal in Morocco; the College of Law at Qatar University; the Faculty of Law and Public Administration at the Birzeit University in Palestine; and the Faculty of Juridical, Political, and Social Sciences at the University of Tunis Carthage. It will be made available to the public at the next ministerial conference of the Arab Anti-Corruption and Integrity Network (ACINET) expected to take place in February 2016. This paper supplements the United Nations Development Programme’s (UNDP) Guidance Note on Fostering Social Accountability, which explains the organization’s approach to social accountability and provides direction for programming. Its four chapters capture diverse examples of adopting a social accountability approach to existing programming and of new initiatives in which social accountability principles and tools were used to promote two-way dialogue between citizens and the state, address social exclusion or increase citizen engagement in service delivery. They also illustrate the possibilities for making democratic governance more effective in delivering development outcomes. This Guide published by UNODC outlines practical considerations for developing, implementing and improving anti-corruption ethics and compliance programmes for companies. Each chapter or section of the Guide concludes with a practical checklist to inform implementation. This study aims to foster an environment of integrity, transparency and accountability in the administration courts by reviewing the legislative framework governing management work and its responsiveness to those contents. It will also focus on the practical challenges facing the administration in its exercise of functions and entrusted powers with regards to the principles of integrity, transparency and accountability in order to overcome them and provide appropriate solutions. Lebanon - Anti-corruption sectoral studies on education, water and health. 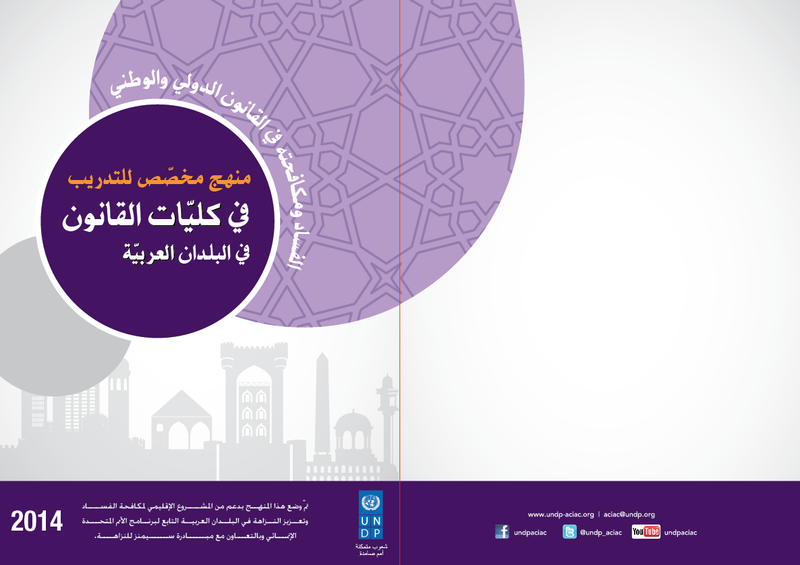 UNDP Lebanon launched three anti-corruption sectoral studies on education, water and health. The studies aim to provide the Lebanese parliament and more specifically the parliamentary commissions with practical solutions to fight corruption in these key public service delivery areas. The studies analyze the reasons behind corruption in each of the sectors and provide a series of recommendations for parliamentary committees on the legislative level and on how to activate related accountability mechanisms with regards to the executive power. This paper conceptualizes public corruption as part of a broader social order context. It conceptualizes public corruption as part of a broader social order context. The paper argues that corruption should not be conceived of as a social ‘malady’ to be eradicated, but rather as a default governance regime. Corruption constitutes one of the major threats to the success of peacekeeping missions. It is often overlooked in planning and execution. Corruption is hardly ever raised in peacekeeping mandates and little guidance is provided on how to prevent it in missions. This report entitled “Corruption and Peacekeeping: Strengthening Peacekeeping and the United Nation“tackles corruption risk confronting peacekeeping. It is developed by Transparency International UK’s Defence and Security Programme. The report provides an overview on how corruption weakens the implementation of peacekeeping mandates. It identifies 28 types of corruption that hinder peacekeeping missions and suggests framework for reform. International - Governance and Anti-Corruption Assessments: Rethinking the Added Value? This article gives an overview of the rationale behind governance and anti-corruption assessments while discussing the current debates on the topic, drawing from related experiences and lessons learned in the Arab region. This report includes a brief overview of the key draft legislative anti-corruption texts and their progress in the legislative process. They include: (1) the right of access to information , (2) anti-corruption in the public sector (national anti-corruption authority), (3) whistleblower protection, (4) illicit enrichment, (5) Central Inspection, (6) Court of Accounts and (7) public procurement. These draft laws and proposals aim at strengthening anti-corruption frameworks and institutions in accordance with international standards, namely the United Nations Convention against Corruption and best practices from comparative experiences. The HUMBOLDT-VIADRINA School of Governance published a comprehensive overview of incentives and sanctions that can be applied to increase the effective engagement of businesses against corruption. The study entitled “Motivating Business to Counter Corruption – A Practitioner Handbook on Anti-Corruption Incentives and Sanctions” features over 30 case studies and practical guidance. The infrastructure sector is associated with corruption. Estimates of financial losses range between 10 and 30% of the value of publicly funded construction projects (Transparency International 2005). Global construction is predicted to grow by 70%, from US$7.2 to US$12 trillion, from 2010 to 2020 (Global Construction Perspectives 2010). Some estimates put potential losses as high as US$2.5 trillion (CoST 2012). This report provides practical guidance on how to identify and mitigate the risks of corruption in the infrastructure sector. It also points to further resources on the topic. The report is developed by Evidence on Demand. It is the DFID-supported information hub designed to give development professionals—working on climate, environment, infrastructure and livelihoods issues—access to world class information and services. Based on the Republic of Lebanon’s commitment to fight corruption, and in the framework of efforts to implement the United Nations Convention against Corruption, the Minister of State for Administrative Development established a committee to develop Lebanon’s National Anti-Corruption Strategy. The Report focuses on the following themes: (1) Completing the legislative framework to prevent and combat corruption, (2) supporting the integrity of public officials, (3) strengthening systems of control and accountability, (4) preventing corruption in administrative transactions, (5) preventing corruption in public procurement, (6) raising awareness and involving society in promoting integrity and combating corruption. Lebanon - Summary of the self-assessment of the implementation of chapters III and IV of the "United Nations Convention against Corruption"
This report, prepared by the Committee in change of conducting the self-assessment of the implementation of the UNCAC, presents the state of the implementation of Convention in Lebanon, and namely Chapter III on the "criminalization and law enforcement," and Chapter IV on "international cooperation". It includes a general introduction, a summary of the results of the self-assessment of each of the Chapters, and a conclusion. This report entitled “Corruption and integrity challenges in the Iraqi public sector” published in September 2012 provides an evidenced analysis of data collected on corruption facts and practices in the public sector in Iraq. It was elaborated under the supervision of the United Nations Development Programme in the framework of its project for the support of the implementation of the United Nations Convention against Corruption in Iraq, with technical contributions from the United Nations Office on Drugs and Crime. Other contributors include the Central Agency for Statistics in Iraq, the Iraqi Commission of Integrity and Kurdistan’s Statistics Agency. This article provides an overview of some of the real challenges facing African governance. The findings of the research focus on several areas including economic transformation, water and sanitation, the design of public education and environmental protection . This report provides an overview of the work and achievements of the UNDP Global Thematic Programme on Anti-corruption for Development Effectiveness (PACDE) in 2012. This News Update includes information on (a) preparations for the first regional training for non-governmental practitioners on anti-corruption assessments (p.2); (b) the launching of the 2009 Global Integrity Index (p.3); (c) a regional workshop on political ethics and conflict of interest (p.4); (d) the prospective launch of regional work on integrity in the private sector in the Arab region (p.5); (e) extending anti-corruption cooperation between UNDP and Yemen (p.7); (f) a new specialized corruption prosecution office in Yemen (p.8); in addition to (g) a usual stop at other Arab anti-corruption highlights (p.9). This is ACINET’s Programme of Work for its second work cycle (2010-2011). It was developed based on the results of regional research and consultation conducted during the first work cycle (2009-2010), under the chairmanship of the Hashemite Kingdom of Jordan. The Programme was endorsed by the Members at the second General Meeting that was held in Sana’a on 27 July 2010. It will be implemented under the chairmanship of the Republic of Yemen, with the support of UNDP’s Programme on Governance in the Arab Region and in cooperation with various regional and international partners. The booklet contains detailed information on the Arab Anti-Corruption and Integrity Network (ACINET), as well as the Constitutive Declaration, Charter and Rules of Procedure of the Network. This Network aims at contributing to the promotion of integrity and combating corruption in the Arab region through securing a permanent regional forum for Arab officials to exchange knowledge, expertise, and experience; it also provides a strategic framework for supporting national efforts aimed at implementing relevant Arab and international resolutions and conventions, particularly the United Nations Convention against Corruption. This News Update includes information on (a) Morocco Completes the UNCAC Self Assessment Report and Submits it to the Secretariat of the Conference of State Parties (p. 2); (b) The Fifth Meeting of the Open-Ended Inter-Governmental Working Group on the Review of UN Convention Against Corruption Implementation (p.3); (c) The League of Arab States Prepares to Organize a Coordination Meeting in Anticipation of the Conference of State Parties to the UNCAC (p.4); (d) UNDP Prepares to Launch a Project to Support the Jordanian Anti-Corruption Commission (p.5); and (g) a usual stop at Arab anti-corruption highlights (p. 6). This News Update includes information on (a) the commemoration of the “International Anti-Corruption Day” by the UN (p.2), ACINET (p.3), and in a number of Arab countries (p.5); (b) a workshop in Egypt for the Asia-Middle East Dialogue (AMED) countries” (p.8); (c) a regional workshop on investing and prosecuting corruption (p.9); (d) a new member in ACINET (p.11); (e) a cross-continental e-discussion on “capacity development for anticorruption (p.12); and (f) the usual stop at Arab Anti-Corruption Highlights (p.13). This News Update includes information on (a) ACINET’s Programme of Work for 2009 (p.2); (b) new ACINET memberships (p.4); (c) Training of Trainers for Iraqis on on Anti-Corruption Self-Assessment and GAP Analysis (p.4); (d) National Workshop on Investigative Journalism for Written and Audible Media in Yemen (p.6); and (e) a usual stop at Arab anti-corruption highlights (p.7). This News Update includes information on (a) ACINET’s first event for 2009 on “Witness and Whistleblower Protection” (p.2); (b) new ACINET memberships (p.3); (c) efforts to develop an advanced UNCAC Self Assessment Checklist (p.3); (d) preparations to organize “Global Forum VI on fighting Corruption and Enhancing Integrity” in Qatar (p.6); (e) 20th UN/INTOSAI Symposium (p.7); (f) the 4th Global Conference on the Extractive Industries Transparency Initiative in Qatar (p.9) and (g) a usual stop at Arab anti-corruption highlights (p.9). This document represents the Summary Programme of Work of the Arab Anti-Corruption and Integrity Network for 2009-2010. It includes the work that will be supported during the year and is divided to four components: First, UNCAC Self Assessment. Second, Witness and Whistleblower Protection. Third, National Anti-Corruption Strategies and the Role of Different Stakeholders. Fourth, knowledge networking at national, regional and international levels. This News Update includes information on (a) Commemorating The International Anti-Corruption Day (p.2); (b) Three new members join ACINET (p.3); (c) new anti-corruption measures in Yemen (p.5); and (d) a usual stop at Arab anti-corruption highlights (p.6). This News Update includes information on (a) the establishment of the Arab Anti-Corruption and Integrity Network – ACINET (p.1); (b) the selection of ACINET’s chair (p.3); (c) Latest news on the coordination between ACINET and the League of Arab States (p.3); news about ACINET membership (p.4) and (d) a usual stop at Arab anti-corruption highlights (p.5). This News Update includes information on (a) the 13th International Anti-Corruption Conference in Athens and side events (p.1); (b) the 3rd Global Conference for Parliamentarians against Corruption in Kuwait (p.3); (c) Qatari preparation to host key global anti-corruption events in 2009 (p.5); and (d) a usual stop at Arab anti-corruption highlights (p.7). This primer explores the theoretical and empirical relationship between corruption and the various aspects of development including economic growth, poverty, human rights, gender, governance, human development, and environment and sustainable development. It recommends ways in which UNDP could integrate anti-corruption principles and strategies with its technical assistance to effectively implement anti-corruption interventions to reduce poverty, realize the Millennium Development Goals and promote sustainable development. This primer complements the practice note "Mainstreaming Anti-Corruption in Development" by extending concepts and programming guidelines. This Guidance Note is a collective endeavor of the Democratic Governance and Anti-Corruption Community of Practices within UNDP. The purpose of these meetings was to formulate UNDP’s corporate position on anti-corruption. This is a comparative study on the UN Convention against Corruption (UNCAC), which was signed in 2003, and the compatibility of legislation in Egypt, Jordan, Lebanon, Morocco, United Arab Emirates and Yemen with the provisions of this Convention. The study of a joint project by the UNDESA -United Nations Department of Economic and Social Affairs- and the UNDP-RBAS -United Nations Development Programme-Regional Bureau for Arab States. The study aimed to assist national or central governments in the Arab region to improve transparency and accountability in the public sector, through comparing existing policies and practices in public sector financial, human resources and financial management. This document includes a brief description of the events that are scheduled to take place in 2011 in the framework of the Anti-Corruption and Integrity in the Arab Countries (ACIAC) project. The Central Authority for Corruption Prevention launched this report on 11 June 2014 to present the outcome of its work during the past 5 years and a list of various recommendations to strengthen anti-corruption efforts, centered around 6 strategic directions which are translated into 37 proposals and 260 legal, institutional and practical procedures. International - "What’s Yours Is Mine: New Actors and New Approaches to Asset Recovery in Global Corruption Cases"
In its latest policy paper – “What’s Yours Is Mine: New Actors and New Approaches to Asset Recovery in Global Corruption Cases” -- the Center for Global Development (CGD) looks at what it describes as an ‘evolutionary process’ in the battle against corruption. Progress has been made in finding and prosecuting the guilty, but more effort and imagination will be needed for changes in accountability and transparency to continue, according to the paper. This Charter was developed in July 2013 by the Supreme Authority for the National Dialogue on the Reform of the Justice System in Morocco. The Authority was formed under the chairmanship of the Minister of Justice and Freedoms and includes a variety of members from different concerned sectors. Its meetings concluded in the drafting of recommendations for the reform of the justice system. The charter includes a first part on the general principles for the reform of the justice system, and a second part on major strategic goals as well as sub-goals. This Practical Guide is a product of the experience of having designed, implanted, assessed and evaluated, social audit projects and processes inside and outside the United Nations System. It is also a product of a number of training and capacity building activities undertaken over the last decade. The Practical Guide compiles and structures some of these experiences, the lessons learned, the conclusions and the implications of initiatives that have been taken globally to improve governance through social audits. This report explores the dynamics between corruption and post-conflict recovery processes. It provides insight, based on research in Afghanistan, the Democratic Republic of the Congo, Iraq, Sierra Leone and Timor-Leste [East Timor], into how UNDP has grappled with the challenges of anti-corruption interventions. It considers when and how corruption emerges as a relevant issue on the political agenda, and how the international community has acted and reacted vis-à-vis corruption and its risks, and what challenges and tradeoffs they have dealt with. Finally, it gives suggestions on how to mitigate the identified challenges, and elaborates recommendations for entry points for UNDP anti-corruption programming in post conflict situations. Iraq - Al-Shafafiya (Transparency) - Special edition "Corruption in Iraq"
Issued by the Arab Anti-Corruption Organization. A publication of the Coalition for Accountability and Integrity – AMAN. The report observes both positive and negative changes in the nature and prevalence of corruption in the various Palestinian sectors and describes the changes that occurred and the factors underlying corruption in 2008. This report seeks to assist decision-makers, politicians and civil society institutions to take necessary actions and steps, each according to their respective positions and functions, in order to reduce the prevalence of corruption. The private sector plays a pivotal role in fighting corruption worldwide. Transparency International’s Global Corruption Report 2009 documents in unique detail the many corruption risks for businesses, ranging from small entrepreneurs in Sub-Saharan Africa to multinationals from Europe and North America. This booklet comprises the presentations and studies that were presented in the regional conference on “Corruption and Money Laundering” held in Sharm El Sheikh, Egypt on October 21-22, 2007, in cooperation with the Egyptian Public Prosecution Office. The booklet addresses the following themes: introduction to the criminalization of corruption and money laundering, capacity building of prosecutors in investigation, and the importance of international and regional cooperation in the fight against corruption and money laundering. This manual offers hands on tools and guidance to measuring corruption at the country level. Based on the Users' Guide to Measuring Corruption (2008), it has been developed to help meet the growing global demand for capacity development in this area. The manual is written for trainers, and provides step-by-step guidance and materials for adapting and delivering the training in any country. An analysis of Morocco's adoption of many "standard" anti-corruption legal provisions (particularly through comparisons with a group of "comparator countries") as well as estimates of the costs and benefits of adopting the various provisions contained in the current anti-corruption action plan. A Users’ Guide to Measuring Corruption, jointly produced by UNDP and Global Integrity, is one of the first attempts to explore how best to use existing tools to measure what is increasingly viewed as one of the major impediments to development: corruption. This report was published on April 2009 by the Coalition for Accountability and Integrity - AMAN. The Report highlights the ongoing efforts to promote values of integrity, principles of transparency and accountability in order to fight corruption in Palestine. It also emphasizes the roles and efforts undertaken by all concerned parties, both official and civil society organizations. Banque du Liban [Central Bank of Lebanon] - Special Investigation Commission - Fighting Money Laundering. Corruption in the water sector puts the lives and livelihoods of billions of people at risk. As the Global Corruption Report 2008 demonstrates, the onset of climate change and the increasing stress on water supply around the world make the fight against corruption in water more urgent than ever. Without increased advocacy to stop corruption in water, there will be high costs to economic and human development, the destruction of vital ecosystems, and the fueling of social tension or even conflict over this essential resource. This report clearly shows that the corruption challenge needs to be recognized in the many global policy initiatives for environmental sustainability, development and security that relate to water. This update provides an account of UNDP's work in anti-corruption in recent years. It explores the relationship between corruption and development including economic growth, poverty, human rights, gender, governance, human development, environment and sustainable development. This is a legislative oversight and advocacy skills training report on the roles of Palestinian Civil Society Organizations in the Gaza strip in the legislative process. This manual provides an overview of what constitutes corruption, who may be liable for corruption, and how it may be avoided. It provides detailed examples of corruption with simple anti-corruption rules and practical advice as to what should be done. This Glossary aims to assist the Istanbul Action Plan countries to implement the country recommendations on anti-corruption legislation by providing the context for the country recommendations, and examining and elaborating the standards. This paper surveys the nature, causes, consequences and mechanisms of corruption in post-war Lebanon. It provides an overview of the nature of the Lebanese state and describes corruption before and during the civil war. This guide focuses on the principal UN Convention against Corruption in force in the Middle East and North Africa. It explains the Convention’s uses; describes why and how to promote national ratification, implementation, intergovernmental monitoring; and discusses ways to carry out civil society monitoring. International - Anticorruption in Transition: Who is Succeeding…and Why? This report examines patterns and trends in corruption in business-government transactions in Europe and Central Asia and the progress achieved by countries in addressing it. The manual is structured to allow examiners to tailor the BSA/AML examination scope and procedures to the specific risk profile of the banking organization. The paper discusses the argument that fiscal decentralization increases accountability in the spending and raising of public funds by moving government closer to the people and the concerns that fiscal decentralization in practice may lead to a decentralization of corruption. The objectives of this survey are to determine which U.S. government agencies participate in the anticorruption program in Iraq and whether program outcomes have been established to measure progress and success to meet the program goals. This publication outlines strategies to minimize and combat corrupt conduct in the public sector. It highlights situations that must be addressed and gives guidance on how to deal with these scenarios. It also gives public sector agencies the tools to revise, develop and implement a gifts and benefits policy and procedures in line with best practice. This note highlights some of the main issues in the debate on how best to measure corruption and monitor progress in reducing it, in the form of six myths and their associated realities. This guide, published by Aman-Palestine, discusses corruption in the Palestinian Society and its effects. It provides parliamentarians with practical advices on how to fight corruption. This paper focuses most on the area of tax evasion, and makes reference to the black market activity. This survey took place in Washington, DC, between April 17 and May 7, 2006, and in Baghdad, Iraq, between May 7 and May 20, 2006. Its aim is to establish an anticorruption strategy to build and sustain an effective anticorruption effort in Iraq. Designed as a quick reference source, the Reader collects and summarizes key books and articles on corruption and anticorruption programs. It provides background analysis and information to deepen the understanding of the symptoms, causes, and effects of corruption, as well as successful strategies for attacking it. The Code of the International Federation of Accountants (IFAC) serves as a model for all codes of ethics developed and used by national accountancy organizations. It endorses the concepts of objectivity, integrity, and professional competence and highlights how all accountants can attain the highest levels of performance in meeting their responsibilities to the public. The book contains 21 major relevant international and regional treaties, agreements, resolutions and other instruments. The first section of the book contains a very useful summary of international legal instruments. This handbook, published by the Global Organization of Parliamentarians Against Corruption, is a guide to parliamentarians around the world interested in good governance and combating corruption. It discusses the relation between the parliament and good governance, the causes and consequences of corruption, controlling corruption, parliaments and coalition building tools and tasks, and building parliamentary networks. This guide, published by ARPAC, deals with the challenges of governance in the Arab countries and the role of parliaments in promoting accountability, transparency and participation. It introduces the notion of corruption and enumerates the five main elements to fight corruption: political accountability, institutional regulations on political power, a competitive private sector, public sector governance and civil society participation. It places emphasis on the main role of parliaments which consists in calling for reforms to fight corruption and realizing these reforms by building parliamentary networks and alliances. This guide is supplemented with annexes, namely the United Nations Convention against Corruption, articles from the bill on the fight against corruption in Algiers, as well as case studies from Lebanon, Kuwait, Bahrain, Egypt, Palestine and Jordan. This is the Lebanese Transparency Association research project to promote transparency in post-war reconstruction. The project led to number of studies and workshops that analyzed the cost of corruption and its nature, role and impact on the Lebanese economy and political system. This paper analyzes corruption in post-war reconstruction as a pattern, through exploring consensus politics in Lebanon. Since the accession to power of the current ruler, Qatar has seen significant political liberalization and many reforms have taken place. However, if the reforms are not to suffer the fate of their predecessors, they need to be consolidated through the holding of promised elections, enforcement of constitutional rights to free association and constitutional review, encouragement of governmental transparency and accountability, and a crackdown on corruption. This statistical work and coordination is carried out at the University of Passau. This index has evolved into a leading indicator in social sciences. Its goal is to provide data on extensive perceptions of corruption within countries. This Handbook serves as an authoritative source on the objectives, analytical framework and methodologies of financial sector assessments as well as a comprehensive reference book for training on the techniques of such assessments. The main task of this paper consists in identifying and exposing mismanagement and corruption in the public sector, thereby holding governments accountable for their actions. The 2005 Global Corruption Report focuses on corruption in construction and post-conflict re-construction. It includes reports on the mechanisms of corruption in construction projects, the economic cost of corruption in infrastructure and the environmental risks of corruption in construction. The 2006 Global Corruption Report focuses on corruption in the health care system and the responsibility of the members of governments, international institutions, the private sector and civil society to safeguard the right to health. The Bank has a comprehensive and integrated anti-corruption strategy in place, and it has taken a clear public stance – based on exhaustive research – that corruption is an impediment to growth and poverty reduction. The analysis is mainly founded on bureaucratic/public sector corruption, with special emphasis on administrative bribery and distinction between forms of corruption. This report uses a new framework for typologies and discusses the following: Alternative remittance systems; Insurance and money laundering vulnerabilities; Money laundering associated with human being trafficking and illegal migration. This report focuses on the sectors and institutions that are most affected by corruption, the spheres of life most affected by corruption, the evolution of corruption over time, the frequency and costs of bribes, as well as the forms they take. This publication contains articles and studies that were written and presented during the constitutive meeting of ARPAC held in Beirut in November 2004 under the aegis of UNDP-POGAR. This index explains the trends for perceived levels of corruption between 1995 and 2005. This workshop consists of four sessions which focus on the following topics: the role of monitoring in international anti-corruption policies, the corruption monitoring methodologies and instruments (comparative review, public and political impact), and the emerging basic parameters for evaluating and measuring corruption. Political leaders in many countries have already declared combating corruption as their priority and a growing number of international and national non-governmental organizations is engaged in unmasking corruptive practices. This booklet provides examples of best practices in fighting corruption and case studies that are narrative examples whose lessons can be applied as individual country circumstances allow. The report outlines preventive measures against corruption, the role of Civil Society and the media, legislative measures to implement the United Nations Convention against Corruption, and measures to combat corruption in national and international financial systems. The 2004 Global Corruption Report focuses on corruption in the political process and on the insidious impact of corrupt politics on public life in societies across the globe. This Handbook takes its place among the toolkit that continues to be developed by the United Nations Office on Drugs and Crime. This is intended to provide a range of options that enable each country to assemble an effective integrated strategy, adapted to meet its own particular needs. This index explains the trends for perceived levels of corruption between 1995 and 2004. This toolkit argues that the quality of urban governance means the difference between cities characterized by prosperity and inclusiveness and cities characterized by decline and social exclusion. It provides tools to increase transparency and maintains that increased transparency can help combat urban poverty and enhance civic engagement. The Anti-Corruption Handbook is a practical tool, which aims to assist the process of design and application of anti-corruption reform measures. Intended as a one-stop reference for practitioners from all over the world, the Handbook provides a unique and up-to-date overview of key policy reform elements, and develops a framework for their effective implementation illustrated by examples of good practices. Tackling Corruption at its Roots. The Transparency International Global Corruption Barometer 2004, a public opinion survey of more than 50,000 people in 63 countries, found that political parties, parliaments, the police and the judiciary continue to be rated the most corrupt institutions by citizens worldwide. The practice note aims to provide a framework to develop UNDP's approaches and interventions and facilitate the knowledge network on Accountability, Transparency and Integrity (ATI) and anti-corruption, as a cross-cutting issue in the over-all democratic governance community of practice. The 3rd edition of the tool kit- a Global Programme Against Corruption publication- covers institution building anti-corruption legislation, prevention, monitoring and evaluation, awareness raising and repatriation of illegal funds. The Toolkit provides, based on the recently adopted UN Convention against Corruption, an inventory of measures for assessing the nature and extent of corruption, for deterring, preventing and combating corruption, and for integrating the information and experience gained into successful national anti-corruption strategies. This handbook provides information and resource materials for countries developing and implementing anti-corruption strategies at all levels. It also outlines some elements related to civil society with an interest in combating corruption. The document outlines the political commitment to the fight against corruption. It focuses on putting effect to Criminal Law instruments and building up an anti-corruption culture in the EU institutions. This paper provides a status report on the 12-month pilot program of Anti-Money Laundering and Combating the Financing of Terrorism (AML/CFT) assessments, using the AML/CFT methodology. "Inclusiveness means that all those who have a stake in a governance process and want to participate in it -men and women- rich and poor, rural and urban- are able to do so and on equal basis…Inclusiveness also means that government treats everyone equally…Accountability is based on the idea that people have the right to hold their governments answerable for how they use the authority of the state and the resources of the people." This book contains all the major relevant global and regional international treaties, agreements, resolutions and other instruments including both legally binding obligations and some "soft-law" or normative instruments to serve as non-binding standards. This presentation revolves around the role of corporate governance initiatives in developing economies. It sheds the light on the dynamics of corruption in the Lebanese private sector, and discusses possible ways of dealing with it. The main objective of this literature review is to organize the existing knowledge on decentralization and corruption, discuss the major controversies within and across disciplines and identify some areas in most need for further research with an emphasis on questions relevant for development policy. This report assembles the Seminar on the Effective Prosecution of Corruption’s background papers and case studies, and views on the key topics that formed the basis for discussion including: the challenge of prosecuting corrupt businessmen and politicians, prosecuting bribery effectively, as well as case studies and experiences from around the world. This guide provides advice on planning an inquiry, maintaining the integrity of the inquiry, and ensuring confidentiality and fairness during the process. It has been designed to be used throughout the public sector. This document presents the text of the recommendation which was adopted by the Committee of Ministers on 8 April 2003 at the 835th meeting of the Ministers’ Deputies. This index explains the trends for perceived levels of corruption between 1995 and 2003. This paper has 40 recommendations that constitute a new framework for combating money laundering and terrorist financing. This guide contains a general outline of the nature and scope of the problem of corruption and a description of the major elements of anti-corruption policies, suitable for use by political officials and senior policy-makers. The report defines UNDP's Accountability, Transparency and Integrity programming and outlines entry points for anti-corruption reform strategy. Framework Document 2002 deepens insights on the precision of perceived levels of corruption. It complements the press material provided by TI and another background paper, the framework document, which explains in detail the sources used and the aggregation methodology. This paper reviews the system of democratic governance that the South African government put into place in 1994 based on universal suffrage and underpinned by a Bill of Rights. It examines the laws and institutions that were in place, which were designed to the new legal and social order. This Kit presents a number of innovative anti-corruption tools developed and implemented by civil society, and makes the tools available to interested parties. Due to an intense climate of authoritarian rule, Anti-corruption strategies in the Middle East and North Africa (MENA) are unlikely to achieve greater success in the future without the initiation of far-reaching political reform. Civil society anti-corruption initiatives are rarely translated into tangible change owing to the low levels of civil rights, freedom of expression and political participation that are prevalent throughout the region. The present study provides an overview of the issue and its impacts, obstacles to recovery and return of funds or assets and concludes with possible future action. This article shows how the Moroccan government responded to widespread concerns about corruption. On the on e hand it vigorously took up the challenge and allowed non government organizations to investigate various excesses at home. On the other hand, the publicized efforts led to few effective changes, given the close connections between the monarchy and the business community. Denoeux documents the Moroccan anti-corruption campaign efforts. This index explains the trends for perceived levels of corruption between 1995 and 2002. This paper discusses effects of money laundering on economic development. It does so with respect to The financial Sector; the real sector; and the external sector. This publication contains selected conference papers pertinent to the themes of the third annual conference of the Asian Development Bank/Organisation for Economic Co-operation and Development Anti-Corruption Initiative for Asia-Pacific. This paper presents empirical results on public sector corruption while proposing the use of six objective explanatory variables to capture the effects of corrupt practices in the courts. It also proposes an empirical model, which incorporates substantive-procedural, market-related, and organizational explanatory variables tested within the judicial sectors of Argentina, Ecuador, and Venezuela. This is an economic analysis of corrupt activities within the judicial sector in developing civil law systems. A rigorous public policy approach to the study of corruption must be empirically verifiable if we are to develop reliable public policy prescriptions in the fight against official corruption. This Framework Document 2001 deepens insights on the precision of perceived levels of corruption. It complements the press material provided by TI and another background paper, the framework document, which explains in detail the sources used and the aggregation methodology. This is the updated copy of the Code of good practices of transparency in monetary and financial policies. The Global Corruption Report 2001 examines the current ‘state of corruption’ around the world, analyzing recent developments, identifying ongoing challenges and pointing to possible solutions. The report contributes a global dimension to the concept of National Integrity Systems, as set out in the TI Source Book. This paper reviews the most recent literature related to economic causes of corruption within the public sector in general and particularly within the court systems in developing countries. It shows the need to generate public policies based on sound and scientific principles that can be accepted by civil societies and the public sector at the same time. The policy describes a practical framework for thinking about anti-corruption initiatives in the public sector in developing countries. The paper also suggests that a direct approach to fighting corruption may not always be the best or the only option. IOG Policy Brief No. 11, April 2001. This is the report of the committee on international investment and multinational enterprises on the implementation of the convention on combating bribery of foreign public officials in international business transactions and the 1997 recommendation. OECD Council at ministerial level on May 15-16, 2001. This index explains the trends for perceived levels of corruption between 1995 and 2001. This manual discusses the types, causes and effects of corruption. It also focuses on policies and measures to combat corrupt practices: an integrated approach; administrative and regulatory mechanisms; enforcement; institution-building; awareness raising and public participation; national, international and regional legal instruments; illegal transfer of funds and repatriation of assets; as well as monitoring and evaluation. The Center for International Crime Prevention (CICP) has prepared this manual for the UN to serve as a policy guide for governments in their anti-corruption efforts. The Manual is supplemented by and should be read in conjunction with the United Nations Anti-Corruption Toolkit. The paper promotes an anti-corruption strategy that rests on economic development, democratic reform, strong civil society and the presence of the rule of law. It recommends measures to be implemented on all levels and emphasizes the need for coordination with economic and social policies and the development of a civic political culture. An article by Maroun Kisirwani. The article argues that financial corruption is a fundamental obstacle to administrative reform in general, and to accountable compliance in particular and calls for creating effective control mechanisms to build a rational bureaucracy. This is the Precision and Regional Comparison of Perceived Levels of Corruption - Interpreting the Results background paper. Annual report of the Bureau of Economic and Business Affairs on enforcing and monitoring the OECD Convention on Combating Bribery of Foreign Public Officials in International Transactions as required by the Senate. Presented by the Egyptian Administrative Control Authority (ACA) at the Forum "Fighting Global Corruption: Business Risk Management, May 2000," organized by the US State Department. Page 11 of the report refers to the Egyptian laws that govern the ethics and behavior of security and public officials' vis-à-vis corruption. The policy brief outlines OECD's views on the fight against bribery and corruption and ways of enforcing the Convention on Combating Bribery of Foreign Public Officials in International Business. The purpose of this report is to identify the World Bank's progress in fighting “the cancer of corruption” and to point out the many challenges still facing the Bank. This abstract considers the problem of money laundering world wide, its economic impact, and means of combating it in some Arab and foreign countries and by international organizations. This paper lays out current issues in professionalism and ethics in the public service, cases in countries in transition and in countries in adjustment, and the Brazilian case. This publication is an overview of the issues discussed, practices reported, and conclusions drawn from three events co organized by the Division for Public Economics and Public Administration. Although the conferences took place in different regions, the participants concurred on the central role of the state in the socio-economic development of their nations, the need to depoliticize their bureaucracies, and the importance of responding to citizens' needs. This index explains the trends for perceived levels of corruption between 1995 and 2000. By Jeremy Pope. The TI Source Book has four main sections: framework section, institutional pillars of the national integrity system, their rules and practices, and best practices section. Best practices bring together experience in the area of building and maintaining a country's national integrity system. The source book addresses democratic process, civil society, administrative reforms, administrative law, the ombudsman or mediator of disputes, the judicial system, the auditor general, the public procurement, the private corporate sector, the information and public awareness, the independent anti-corruption agencies, international actors and mechanisms, and good financial management. This policy brief No. 9, May 2000 describes a simple framework for understanding and strengthening the relationship between institutions of accountability and public-sector agencies. This study reviews and analyzes various legal and quasi-legal approaches and mechanisms used around the world in the combat against corruption. It also involves a better understanding of the approaches, mechanisms, instruments and other tools. This focused abstract reviews the problem of corruption world wide and its economic and social impact on all countries. It identifies the factors that contribute to the widespread of corruption, as well as the most prominent international efforts and initiatives undertaken by international organizations to combat corruption. This is the final report of the 1999 conference, a joint project of the Organization for Economic Co-Operation and Development (OECD) and the United States Agency for International Development (USAID). The conference addressed the role of the private sector in the fight against corruption in developing countries and emerging economies. This is the final report of the Global Forum on Fighting Corruption: Safeguarding Integrity Among Justice and Security Officials, which was held in Washington, DC, February 24-26, 1999. The guiding principles for fighting corruptions and safeguarding integrity among justice and security officials. The USAID policy handbook, intended to assist the agency's field staff make informed decisions with regard to developing anti-corruption strategies, outlines a framework for evaluating country-specific causes and appropriate responses to corruption, and describes anti-corruption work carried out by USAID and other organizations. This paper focuses on the use of survey instruments, in particular Service Delivery Surveys as an important monitoring mechanism of state performance. This paper outlines the tools required to advance anti-corruption reform. It discusses economic and social progress, the rule of law under good governance, democratic values, and strong civil society as some basic prerequisites to building the national integrity system that sustains a fight against corruption. PACT's Proceeding of the 9th International Anti-Corruption Conference, October 10-15, 1999, Durban, South Africa. The text of the Arab Agreement on Combating Terrorism approved by the Councils of Arab ministers of interior and of justice. This is the 3rd Annual PACT's Global Workshop on Financial Accountability and Transparency, 2-3 July 1998, held in Bangkok, Thailand. The workshop discussed key issues and new developments in the area of financial management, accountability and transparency, focusing on concrete country and regional experiences. This is the third paper in the series of the UNDP's discussion on good governance. The report discusses the economic causes of corruption, the costs of corruption for economic development and poverty reduction, domestic reforms strategies and the role of the international communities in controlling corruptions in project loans and grants, in supporting reform programs and controlling corruption in international businesses and money laundering. Compilation of texts and countries experiences from the October 1997 conference on Corruption & Integrity Improvement Initiatives in Developing Countries that was organized by the UNDP Program for Accountability and Transparency (PACT) and the OECD Development Center. This documents sets out the twenty guiding principles for the fight against corruption. It also includes some recommendations for the promotion of a dynamic process for effectively preventing and combating corruption. This document describes three pillars of action that could be taken for the prevention of corruption: developing transparent and effective systems for public service, strengthening anti-bribery actions and promoting integrity in business operations, and supporting active public involvement. This paper explores the links between legal and judicial reform and, anticorruption efforts. It also advances some proposals to enhance further the anticorruption thrust of the rule of law agenda. This report presents a synthesis of the results of the Study on Integrity in Morocco led by Transparency Morocco with the support of Transparency International. The study has three aims to identify which population groups are the most vulnerable and exposed to corruption, which sectors have the highest risk of corruption and the causes of corruption and to which extent its different practices are accepted. This questionnaire provides the means by which the authorities in the country being assessed by the International Monetary Fund (IMF) can provide all the detailed input to the assessment process prior to the on-site mission. The web pages provide access to reports on the observance of the standards and codes (ROSCs), covering a number of economic and financial areas, including data dissemination, fiscal, monetary and financial policy transparency, banking regulation and supervision, securities and insurance regulation, accounting, auditing, bankruptcy and corporate governance. GPAC assists Member States in their efforts to curb and prevent corruption. The Global Programme against Corruption is composed of three main components: action learning, technical cooperation, and evaluation. The Annual Reports of the Inter-Arab Investment Guarantee Corporation which includes an Overview of Global and Arab Economic Developments and a Summary of the Corporation’s Activities. The Reports summarize the extent to which countries observe certain internationally recognized standards. The Reports summarize countries' observance of these standards, which include, data dissemination, monetary and financial policy transparency; fiscal transparency; banking supervision; securities; insurance; payments systems; corporate governance; accounting; auditing; and insolvency and creditor rights. This volume has emerged from the efforts of UNDP´s Global Programme on Governance Assessments to document and disseminate knowledge and learning from the practice of participatory governance assessments in different contexts. This paper consists of an overview of the assessment methodology, its background, how it will be used in evaluations/assessments, and a description of what is necessary for an effective anti-money laundering and combating the financing of terrorism. This is an overview of the corruption Perceptions Index that explains the trends for perceived levels of corruption between 1980 and 2005. This paper discusses how political finance is influenced by, and influences, relations between parties, politicians, party membership and the electorate. It considers how problems of political finance are at the heart of the debate on political corruption and how the meaning of political finance-related corruption is often unclear. International - Public Sector Transparency: What Works? The Development Gateway Foundation Special Report on public sector transparency. The special report explores the practical issues of ensuring openness in government, how transparency is being promoted and monitored around the world and illustrates the current international trends in advancing transparency through civil society, government and the media. This manual focuses on the United Nations Convention against Corruption, as well as on civil society's role in ensuring its success in the MENA region. The manual explains the purpose of the Convention, describes the means to encourage the process of national ratification and the mechanism of such ratification, dissociates implementation from monitoring between governments, and discusses the ways for civil society to handle the monitoring process. The Global Corruption Report, launched on 15 October 2001, is the publication of Transparency International that provides an overview of the state of corruption worldwide. A user guide on the implementation of the United Nations Convention against corruption and transnational organized crime. The programme PACT supports and complements good governance efforts and initiatives, through two main components: (1) financial management and accountability systems, and (2) integrity improvement (anti-corruption) initiatives. Financial accountability is approached through records management, accounting, and external Auditing, Records Management forms the foundation for accounting and provides the audit trail for both internal and external audit and a basis for performance review, appraisal and evaluation. Accounting includes planning and budgeting, revenue and expenditure management, internal control and internal auditing, and financial management. The Code defines the mission, principles, standards of professional conduct and the core values, which guide the World Bank Group in its business conduct and work relations with clients and partners.